July 3 (Saturday) at La Dernière Goutte: Tasting of Côte Rôtie with winemaker Stéphane Ogier. Before the tasting, be sure to watch this fun video from David Turecamo that profiles the character of both Ogier and his wine. From 11am-7pm at 6 rue de Bourbon le Château, 75006. July 1 (Thursday) at Spring Boutique: Tasting of four “picnic” wines: Sorelle Bronca Prosecco, Colin Morey St Aubin Blanc, Vacheron Sancerre Rose, Clusel Coteaux Lyonnais. €5 for two six ounce glasses or €10 for all four glasses. From 5-9pm at 52 rue de l’Arbre Sec, 75001. July 1 (Thursday) at Ô Chateau: Wine and cheese lunch at 12pm (€75), French Wine Introductory at 3pm (€30), Grand Crus Tasting at 5pm (€95) and Champagne Cruise on the Seine River at 6:30pm (€95). All events (except the river cruise) at 52 rue de l’Arbre Sec, 75001. 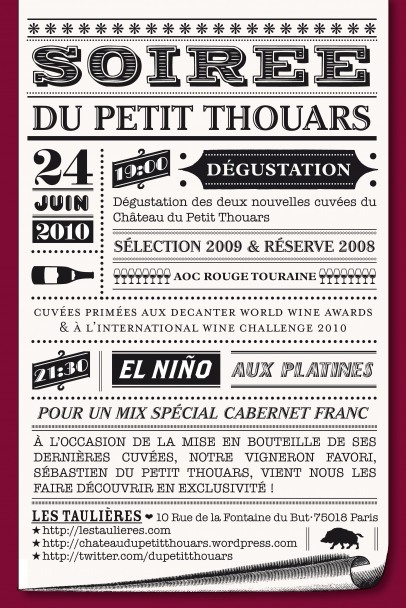 June 24 (Thursday) at Les Taulières: tasting of two Cabernet Francs from the Château du Petit Thouars (selection 2009 and reserve 2008) from 7pm. Later on, Sébastian du Petit Thouars (winemaker/DJ) will be spinning a special Cab Franc-inspired mix of music from 9pm to 1:30am at 10 rue de la Fontaine du But, 75018. June 26 (Saturday) at La Cave des Papilles: Tasting featuring wines from Domaine Nicolas Rousset à Prissé (Macon Prissé 2009), Domaine Alexandre Jouveaux à Uchizy (Vin de Table le Mont 2008), Domaine Karim Vionnet à Villié Morgon (Beaujolais Villages 2009) and Chiroubles “Vin de Kav” 2008. From 11am-7pm at 116 boulevard Haussmann, 75008. From 4pm at 35 rue Daguerre, 75014. 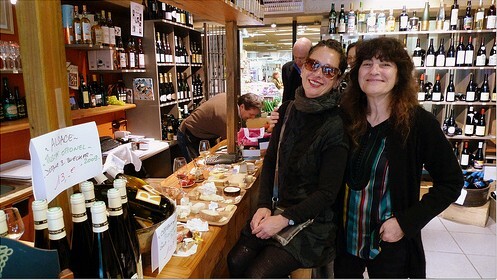 June 26 (Saturday) at La Dernière Goutte: Regional wine tasting accompanied by cheeses and bread from Cosi. From 11am-7pm at 6 rue de Bourbon le Château, 75006. 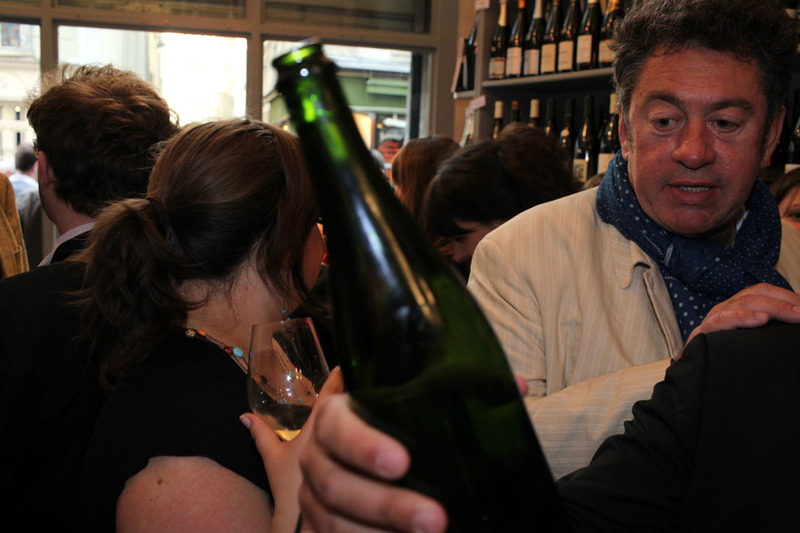 June 24 (Thursday) at Spring Boutique: Tasting of four wines: a 2005 sparkling Vouvray from the Domaine Huet, a 2008 Luxembourgois Moselle (La Chapelle) from Alice Hartmann, a 2002 Lebanese Val de Bekaa (Hochar) from Chateau Musar, and a 2008 Saumur Champigny from Antoine Sanzay. 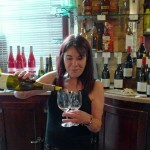 €5 for two six ounce glasses or €10 for all four glasses. From 5-9pm at 52 rue de l’Arbre Sec, 75001. 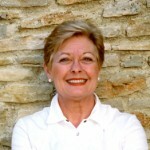 The first cookbook I ever used (but not the first I ever owned) was written by Patricia Wells. I still own this sauce-stained copy of Trattoria and remember our first collaboration: penne all’Arrabiata, cooked for a boy during my senior year of college. Because it turned out well (the pasta, not the affair), Patricia Wells became my hero. That affection was compounded when I later moved to Paris and began abusing a borrowed copy (thanks, Jennifer) of The Food Lover’s Guide to Paris . I relied on Wells’ website fordining recommendations and flipped furtively under restaurant tables through her French/English food glossary. 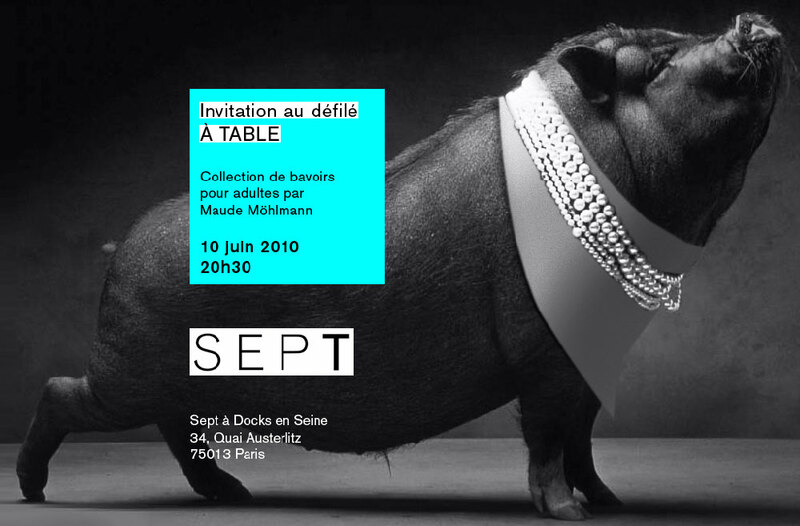 Well, here’s something strange: there’s a fashion show for “adult bibs” by Maude Möhlmann happening tonight along the banks of the Seine river. 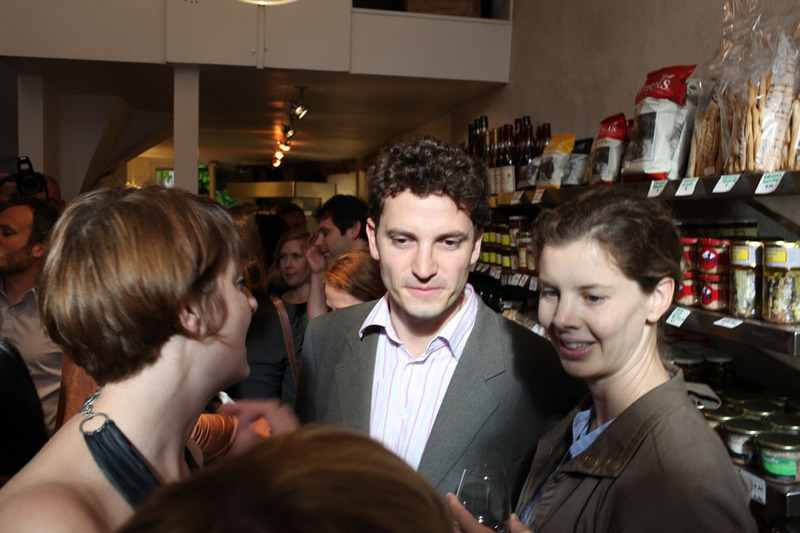 June 10 (Thursday) at Le Garde Robe: tasting with winemaker Arnaud Combier. 41 rue de l’Arbre Sec, 75001. June 11 (Friday) at La Cave du Moulin Vieux: tasting biodynamic Côte de Beaune with the winemaker from Domaine Jean Claude Rateau. From 5pm at 4 rue de la Butte aux Cailles, 75013. 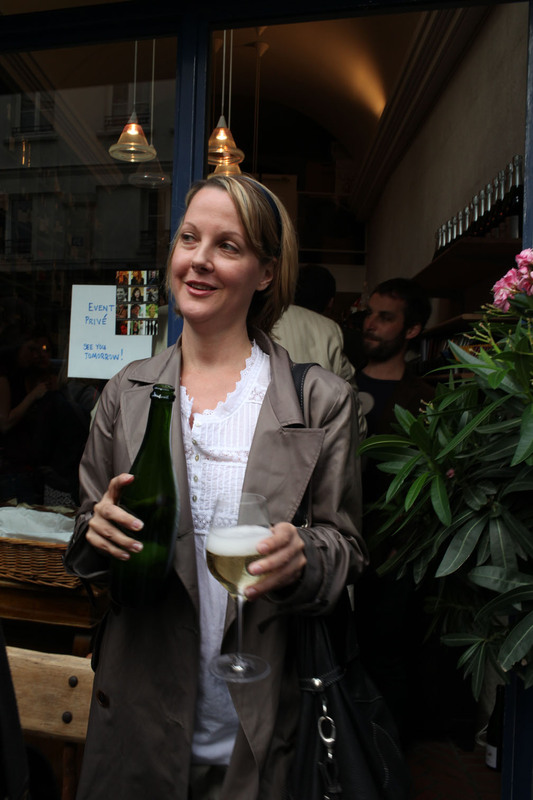 June 12 (Saturday) at La Cave du Moulin Vieux: tasting biodynamic Alsace Grand Cru with the winemaker from Domaine Sylvie Spielmann. From 10am-8pm at 4 rue de la Butte aux Cailles, 75013. June 12 (Saturday) at Cave Balthazar: tasting Châteauneuf du Pape 2008 “vieilles vignes” domaine de la Janasse and Bouzeron 2008 d’Aubert de Villaine. From 10am-1pm and from 4:30-8:30pm at 16 rue Jules Guesde, 75014. 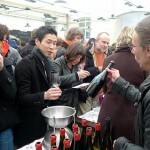 June 12 (Saturday) at La Dernière Goutte: Tasting of Basque whites – Jurançon Sec Cuvée Marie (Domaine Hours) 2008 et 2005 and Irouleguy Hegoxuri (Domaine Arretxea) 2008. 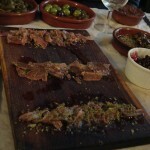 Served with Basque cheeses and bread from Cosi. From 11am-7pm at 6 rue de Bourbon le Château, 75006. Eat the Stars. Be the Star. 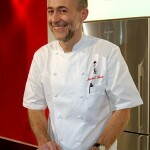 A London-based production company is looking for diners to take part in a new television show fronted by Michel Roux Junior, who will be bringing seven trainees over from London to see how they cope with the formal dining service at the Michelin 2* restaurant Lasserre. Are you free for lunch on Tuesday June 15 at 13:00? Participants must speak some French (to understand the menu and servers) and enough English to be able to share their opinions on camera. They must also be willing to pay €40 per head for a set 3-course lunch, excluding drinks. The normal lunch menu at Lasserre is €75. 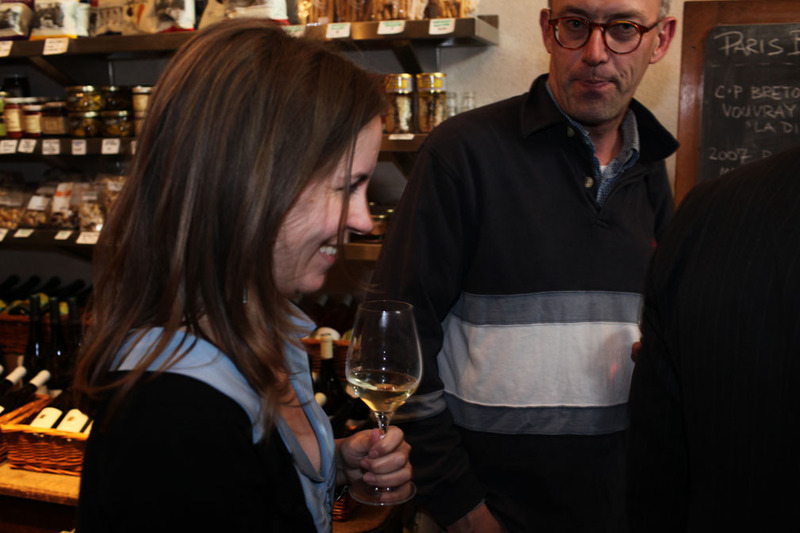 June 4 (Friday)at Le Vin en Tête Saint-Placide: Tasting Côtes de Duras with the winemaker from Chateau Haut-Lavigne (free). From 6:30-9pm at 53 rue Saint-Placide, 75006. 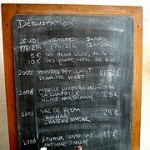 June 5 (Saturday) at La Dernière Goutte: Tasting with Philippe Gourdon of Château de La Tour Grise and Philippe Gilbert of Domaine Gilbert-Menetou Salon (free). From 11am-7pm at 6 rue de Bourbon le Château, 75006. 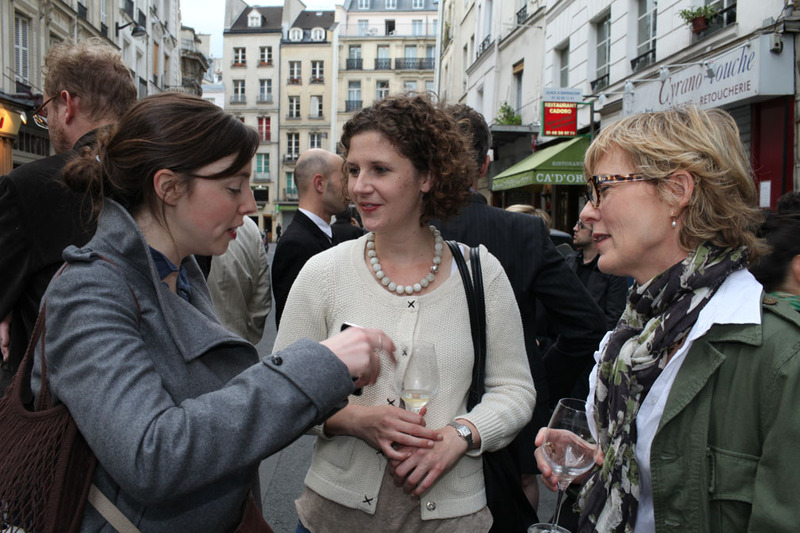 June 5 (Saturday) at Caves Augé: “Wonder Women” tasting, featuring female winemakers from all over France (free). From 11am-7pm at 116 boulevard Haussmann, 75008. 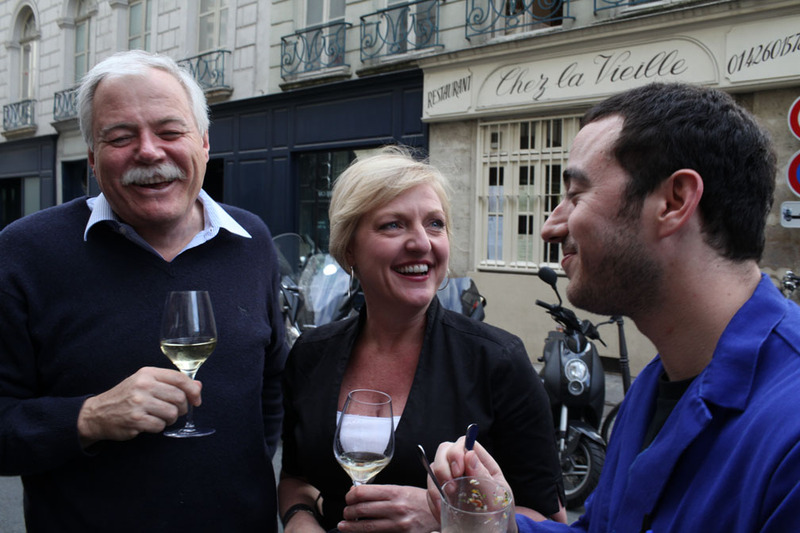 June 5 (Saturday) at Le Vin en Tête Batignolles: Tasting Côtes de Duras with the winemaker from Chateau Haut-Lavigne (free). From 4-9pm at 30 rue des Batignolles, 75017. 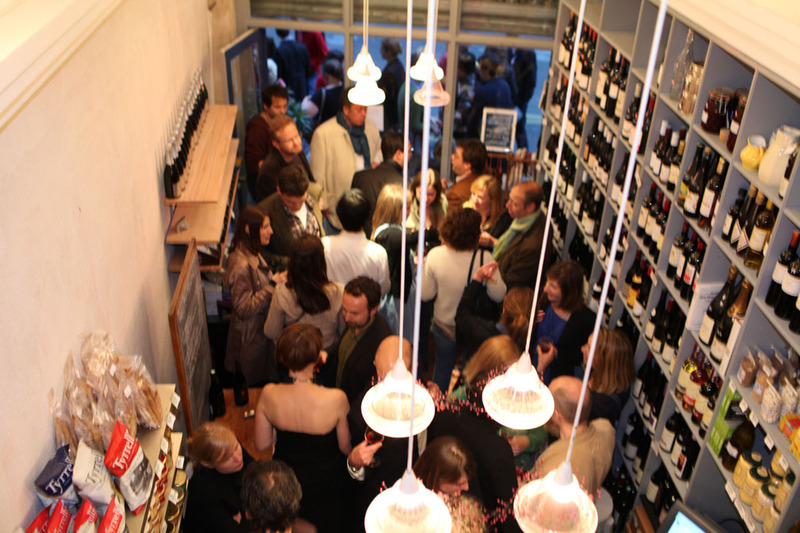 June 5 (Saturday) at Le Vin en Tête Saint-Placide: Inauguration party to celebrate the opening of this new location. 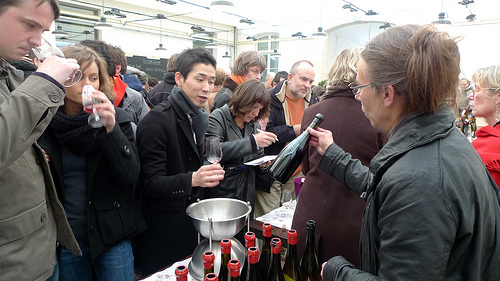 Tastings with many different winemakers (free). From 10am-9pm at 53 rue Saint-Placide, 75006. Before launching at 5:00 this morning, the PbM crew celebrated the new website with a few hundred glasses at Spring Boutique. Bruno Verjus, chasing the good stuff. What: Chef Yannick Alléno (Le Meurice) will be cooking up burgers on the banks of the Seine. As reported earlier by Phyllis Flick, Alléno’s beef – both chuck and rib – will be supplied by Yves-Marie Le Bourdonnec from the renowned butchershop Le Couteau d’Argent in Asnières. Also on offer: veggie burgers and Zubrowka bison grass vodka from Gontran Cherrier, a duck burger from Romuald Sanfourch, and a dessert burger from Christophe Adam (Fauchon). Prices start at €6. 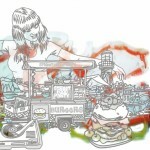 This is the first in a series of “street food soirées” that will take place throughout the summer. Originally from Cleveland, Barbra worked in professional kitchens for more than a decade as a pastry cook, first in Colorado and then in New York where she worked for Jonathan Waxman and Gabrielle Hamilton, among others. 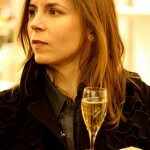 She started blogging about food during a long stay in Paris in 2008 and hasn’t stopped. 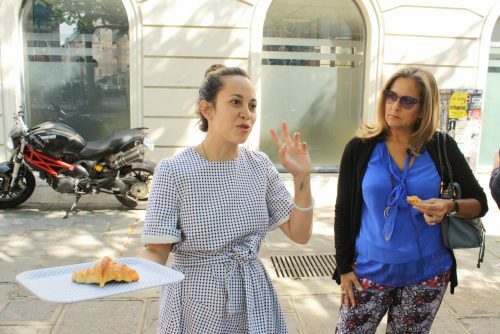 Now based in Paris, she leads gastronomic walks for Context Travel and is a regular contributor to Girls’ Guide to Paris. Casanova is an olive oil lover. Cédric Casanova, that is, the man behind (or with?) 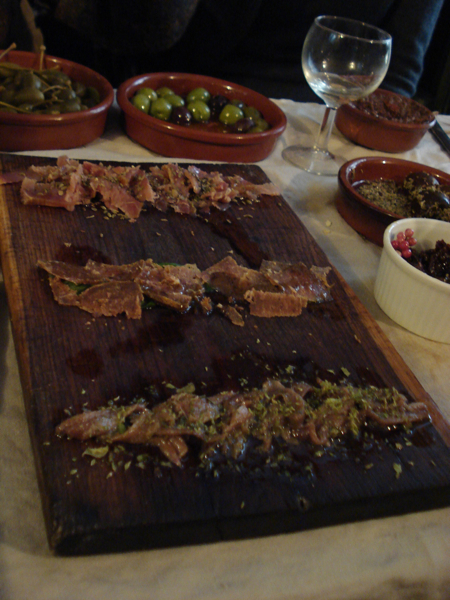 La Tête Dans Les Olives, the closet-sized boutique that becomes a table d’hote for five lucky souls at lunch time. Forget macaroons and truffles for a moment, forget the millefeuilles and éclairs. La Bague de Kenza is a Parisian pastry shop of a different kind. It’s Algerian. Sticky honey, rich nuts, the crunch of semolina, the perfume of orange and roses, chewy dates, rose: These are the themes upon which the the variations of Algerian sweets are built. And they are sweet: The honey in some of them is dizzying, toothache-inducing. I mean that in a good way. A friend who used to live in the Oberkampf neighborhood introduced me to La Bague de Kenza when I was in Paris last month. We talked over lunch, a sort of savory crèpe called m’hadjeb that was filled with tomatoes and onions. 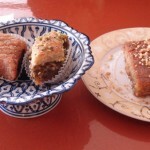 But the small lunch was really just a formality, a sensible precursor to the sweet main event: We shared date-filled maqrout, baqlawa pistache (that’s baklava to you and me), and qualb elouz, a semolina and almond cake drenched with honey.